For heavy-duty applications where a bit harder contact can be tolerated. 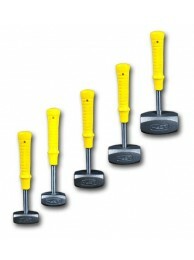 These hammers sacrifice some softness to give 6 to 10 times longer wear. The heads are cast of a malleable iron and annealed to specified “softness”. The handles, consisting of a sturdy steel shank with a contoured safety-grip molded permanently onto it, are extremely durable. The grip, of a cushion synthetic rubber, has a comfortable, no-slip feel when grasped. H-311 Malleable Iron Head Hammer Most versatile of the line, these hammers offer the be..
H-312 Malleable Iron Head Hammer Most versatile of the line, these hammers offer the be..
H-313 Malleable Iron Head Hammer Most versatile of the line, these hammers offer the be..
H-315 Malleable Iron Head Hammer Most versatile of the line, these hammers offer the be..